Neurons in the brain form tangled webs of connections. Within these webs, cells communicate with each other to control motor, cognitive and other functions. 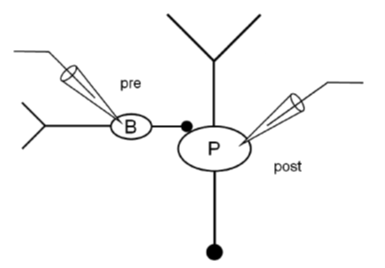 A neuron, when activated, propagates an electrical signal. But that signal cannot cross the synapse – the junction between two neurons. So, communication from one neuron to the next is accomplished by the release of tiny membrane capsules containing signaling chemicals called neurotransmitters across the synapse. The electrical signal triggers these capsules, called vesicles, to fuse with membrane at the neuron’s pre-synaptic terminal, thereby releasing neurotransmitters into the cleft between the two cells. The neurotransmitters travel across the cleft, then activate receptors in the post-synaptic neuron, triggering an electrical signal in that next cell. 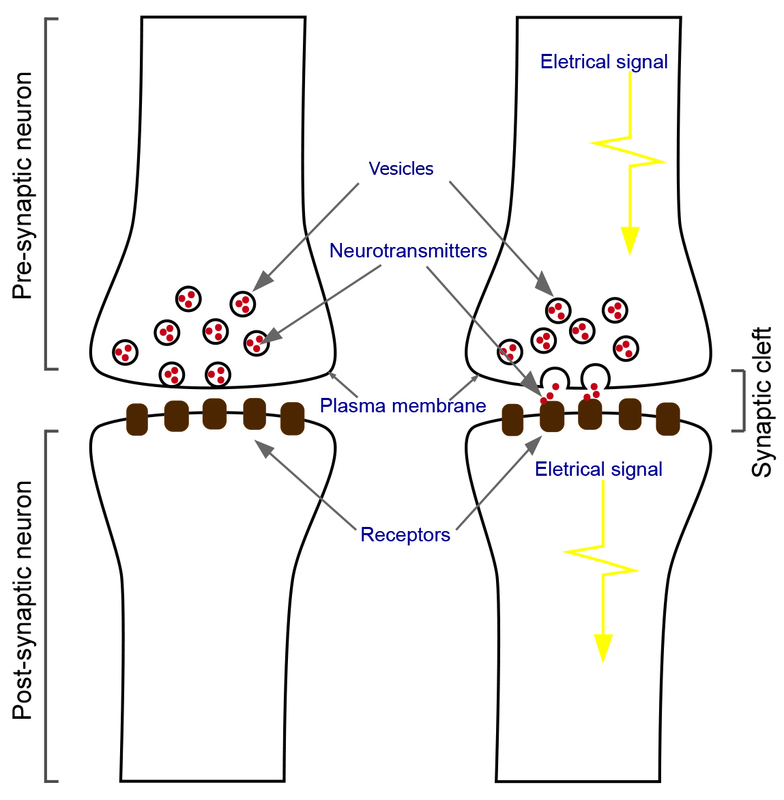 At the synapse, an electrical signal arrives at the pre-synaptic terminal and triggers vesicles to release neurotransmitters into the synaptic cleft. The neurotransmitters activate receptors in the post-synaptic neuron and produce electrical signals. Because the neurotransmitter signal goes in one direction — from the pre-synaptic neuron to the post-synaptic one — vesicles must be re-formed for the process to continue. “Recycling is a critical process to keep synapses functional,” explains Professor Takahashi, leader of the Cellular & Molecular Synaptic Function Unit at the Okinawa Institute of Science and Technology Graduate University (OIST). In a study recently published in Cell Reports, Takahashi and his colleagues shed light on a poorly-understood part of vesicle recycling. Vesicle recycling involves three steps: First, lipid membrane must be pinched off from the neuron’s membrane to form vesicles, a process called endocytosis. Then, the vesicles must be refilled with neurotransmitter. Finally, filled vesicles must be transported to the release site. Although endocytosis has been well-studied, little was known about the refilling process. Prof. Takahashi, in collaboration with a former OIST researcher and colleagues at Doshisha University, now show that for at least one major type of synapse, refilling takes longer than endocytosis. The process of recycling at a synapse. First, lipid membrane capsules are recovered from the pre-synaptic terminal membrane. Then, the vesicles are refilled with neurotransmitter. 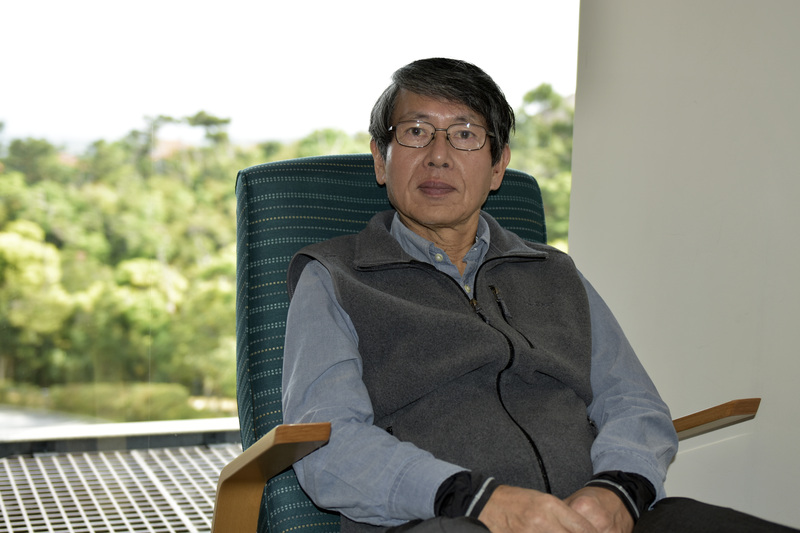 Prof. Takahashi sits in his office at OIST, which overlooks tropical jungle scenery. Neurons can form excitatory connections or inhibitory ones, depending on which neurotransmitters they release across the synapse. The neurotransmitter glutamate passes along an excitatory signal, meaning that it boosts the chance that the electrical signal from the first cell will be passed along to the second. The neurotransmitters GABA and glycine, on the other hand, transmit an inhibitory message, telling the subsequent cell not to fire. At excitatory synapses, Prof. Takahashi’s group has previously measured the rate at which glutamate is taken up into vesicles during recycling. However, this refilling rate had not been studied in inhibitory synapses. Prof. Takahashi and colleagues used glass electrodes to simultaneously take recordings from the pre-synaptic terminal and the post-synaptic terminal at an inhibitory synapse. They showed that, at inhibitory terminals, GABA is taken up into vesicles five to six times more slowly than glutamate at excitatory synapses. The researchers made paired whole-cell recordings using glass capillary pipettes. Caged GABA was injected using presynaptic pipettes. 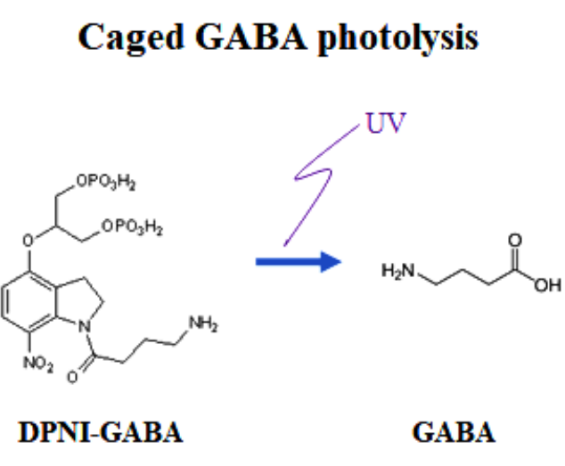 The vesicular GABA uptake rate was estimated using a special technique called caged GABA compound UV photolysis. The researchers injected GABA that was “caged” by a synthetic compound that prevents it from refilling vesicles, into the pre-synaptic terminal. The neurotransmitter’s release from the cage is controlled by UV illumination, which provides the energy to change the synthetic compound’s 3D structure. Using a flash of UV light, the scientists could release the GABA into the pre-synaptic terminal at a specific moment and then measure the rate of uptake of GABA back into the vesicles. The chemical structure of “caged” GABA (left) and free GABA (right). After UV illumination, GABA is released from the compound. Remarkably, they showed that the time taken to refill the vesicles with GABA is nearly identical to the overall time taken for a synapse to recover from synaptic depression – a neuron’s inability to fire because the vesicles carrying the message across the synapse are used up. This implies that most of the recovery time is devoted to refilling the vesicles. In contrast, reforming the vesicles takes relatively less time. Vesicle refilling is time consuming because GABA is concentrated 10-100 times inside the vesicle, compared to the rest of the cell, using molecular pumps. Therefore, the researchers concluded that the slow rate of refilling vesicles with GABA can be a rate-limiting step for the neurotransmitter recycling process at inhibitory synapses. Since all inhibitory neurons in the brain use either GABA or glycine, a neurotransmitter which is recycled in the same way as GABA and refilled into vesicles using the same molecular pump, this principle likely applies to all inhibitory neurons in the brain. This suggests that the vesicle refilling process is crucial to maintaining many important brain functions.